MRI is perfectly safe with any orthopaedic implant (joint replacements, fracture hardware screws and others). The implants may degrade the picture quality in the areas right near the implants but no harm will come to the implants or the surrounding bone. Yes, it is true that minimally invasive approach has been proven not to have great benefits over a conventional incision in terms of blood loss, pain , or speed of recovery in the same surgeons hands. It is only of cosmetic value. How Soon Can I Run After Hip Resurfacing? Age: 60 Address: Jacksonhole, Wyoming state, United States of America. The ReCap® Femoral Resurfacing System replaces the diseased surface of the femoral head and is designed to restore the normal anatomy and biomechanical function of the hip joint. I am 4 days post-op (in 4 hrs) and doing fabulous. We are all different patients, but Mercy Mt Shasta and staff is the best hospital I’ve ever been in and Dr Ure’s office staff is stellar. Don’t let the small town keep you away. The hospital is the cleanest and pristine and nursing staff has a lot of ortho experience. Here’s my story, but feel free to get back to me with questions. 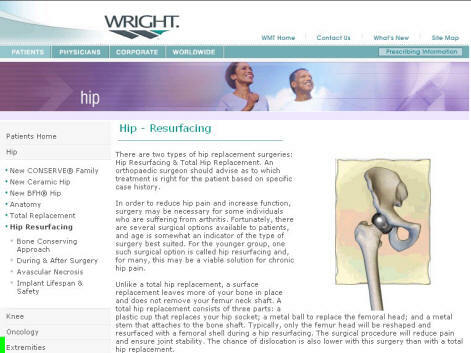 I have AVN, can I have a hip resurfacing? I have now done about 185 resurfacings for AVN cases over a 5 year period with many patients crossing the 4 yrs mark. It is interesting to note there has not been a collapse or fracture neck of femur even in a single patient.